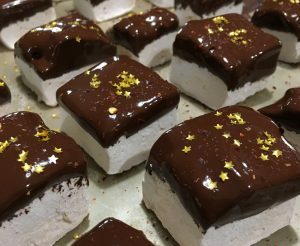 When the kids have gone to bed, the grown-ups get their own marshmallows; tangy-sweet tamarind at the forefront with just a hint of chili at the end, dipped in luscious bittersweet chocolate. 1. 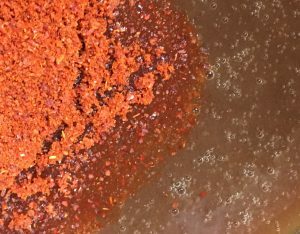 Combine tamarind puree with chili powder. Empty gelatin packets into bowl of stand mixer (whisk attachment), with tamarind-chili puree. Stir briefly to combine. 9. 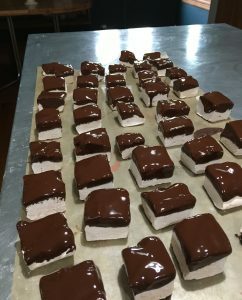 If dipping, melt chocolate (either in microwave on 50% power, stirring every 30 seconds, or over double boiler), stir until smooth. 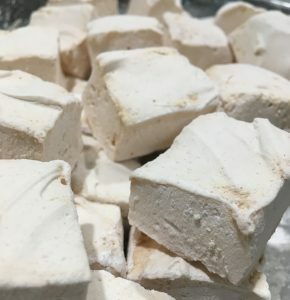 Dip each marshmallow and let dry on waxed paper. Immediately sprinkle after dipping (you can dip the whole set first) with crushed red pepper and edible gold stars.